Kieran Joyce represented the Cats for seven years at senior level. 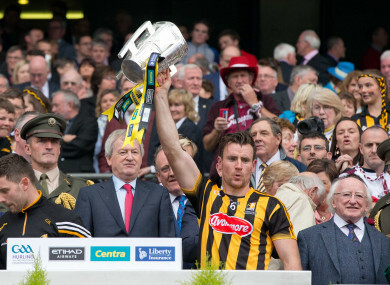 KILKENNY DEFENDER KIERAN Joyce has announced his retirement from inter-county hurling at the age of 30. Winner of four All-Ireland titles, four Leinster crowns and three National Leagues during his seven-year tenure at senior level, he also picked up All-Ireland medals at U21 and intermediate ranks in the black and amber. In a statement released on Twitter this afternoon, Joyce thanked his family and said he intends on finishing out his playing days with his club Rower Inistioge. Email “4-time All-Ireland winner announces retirement from Kilkenny duty”. Feedback on “4-time All-Ireland winner announces retirement from Kilkenny duty”.